The Edmond and Oklahoma City real estate market have heated up over the last several years. In fact, in 2013, Edmond broke a record with over $1 billion in residential real estate sales. Use the search box above to the advanced search tab to find homes that fit what your needs. We have all of the homes for sale in the OKC Metro on this site, regardless of the sign in the yard. It is no secret that Oklahoma is not the most popular state in America. To be honest, not many know too much about our way of life.Legendary images from literature and film have created the mistaken belief that the state is simply a desolate wasteland. Nothing could be further from reality. Oklahoma is a land of striking contrasts; there are majestic vistas, expansive high plains, lush forests and more miles of shoreline along its man-made lakes than the Atlantic and Gulf coasts combined. The state has the largest American Indian population in the country with more than two hundred fifty thousand people representing sixty-seven tribes. At more than fifty-seven hundred feet, the highest elevation is Black Mesa in the northwest corner of the state's panhandle. Oklahoma is bordered by six states; Colorado, New Mexico, Texas, Arkansas, Missouri and Kansas. Essentially, the state is broken down into five regions by directional quadrant, i.e. northwest and southeast, with the fifth region being central. Oklahoma City is in the central region and is the state's capital. The population is thriving at approximately six hundred thousand. Like the state, this city is basically divided into quadrants. Northwest Oklahoma City lies west of Interstate 235 and north of Interstate 40. It is a prosperous sector of the city incorporating around fifty-five square miles. Edmond is an affluent suburban community thirteen miles north of Oklahoma City. 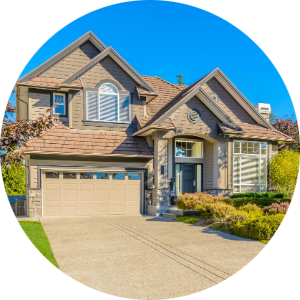 Edmond and NW OKC real estate is in demand as these areas are experiencing steady growth due in large part to a low cost of living and low unemployment rates. Home values are predicted to continue to rise. 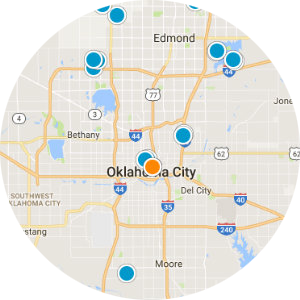 Homes for sale in Edmond and Northwest Oklahoma City can be found most efficiently through MLS listings and by checking with a qualified agent. 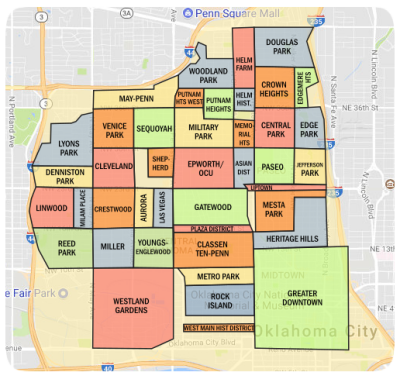 When considering the area, keep in mind that Bethany is an independent city encompassing a little over five miles and situated in the middle of Northwest Oklahoma City. Warr Acres is located adjacent to Bethany to the east and covers three and a half miles. 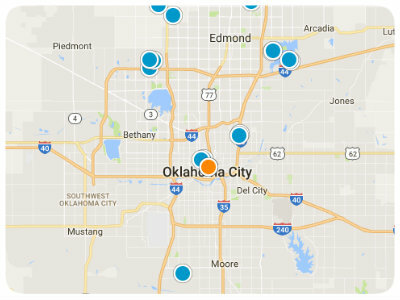 In fact, it can be hard to tell when you have traveled into these and other small cities imbedded within the Oklahoma City metro area. 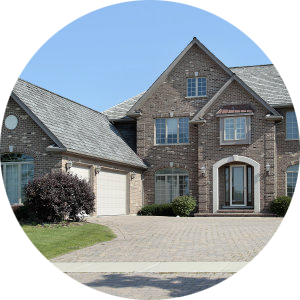 There are a great number of subdivisions and master-planned communities in this region. These can provide residents with valued amenities. With forty-three colleges and universities in the state, twenty-five of which are a part of the Oklahoma State System for Higher Education, it isn't surprising that the number of residents with four year degrees and above is high within the national average. While there are a number of institutions in the Oklahoma City metropolitan area, the closest are the University of Central Oklahoma which is a public institution located in Edmond and Southern Nazarene University, a smaller private institution in Bethany. Commuting from Edmond to the city is quick and easy. Although Metro Transit is available throughout much of the area, residents here prefer to drive with more than eighty percent using a private vehicle. Some of the largest employers in the region include Tinker Air Force Base, the FAA Mike Monroney Aeronautical Center, Integris Health Care, and the State of Oklahoma, who alone employs more than forty-two thousand residents. There is no shortage of outdoor recreation in these areas. Arcadia Lake in Edmond is quite popular as are both Lake Hefner and Lake Overholser in the Northwest. Lakefront property is most likely to be found along some smaller lakes, such as Silver Lake and Ski Island Lake. Affordability and growth offer an ideal circumstance for families, couples, retirees, and professionals. Consider building a good life for you and yours in Edmond or Northwest Oklahoma today. Great opportunity to buy 8.34 acres and build your dream home! This property sits at the end of a cul-de-sac and packed with an abundance of trees.